Narrow Aisle Pallet Racking or VNA (Very Narrow Aisle) Pallet Racking is Selective Pallet Racking configured in a special way to maximise usable space in your warehouse. By squeezing Aisles together and using a VNA Fork Truck you are able to maximise the space which you are own or rent to the greatest potential. Used in many high volume warehouses to perfection. With the ability to select from every pallet position, this style of rack configuration is perfect for high turnover, high volume and large SKU warehouses. With Narrow Aisle Pallet Racking you can also save cost of floor space and drive time for forklifts by having all the racking so compressed, tighter aisles means you require less floor space for storage. This style of racking is also generally used in high cube warehouses across the country to maximize the space available even further by using all of the height under the ceiling. If you are interested in buying Used Narrow Aisle Pallet Racking, please get in touch with our experienced team via our Contact page. Call or message at your leisure. 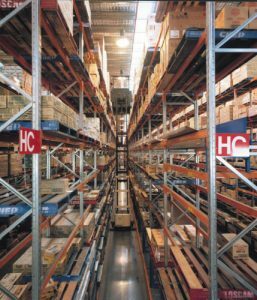 Ware Hows – leading supplier of Used Narrow Aisle Pallet Racking to businesses throughout Brisbane and Australia wide.